An Ammunition Ship (AE) is a ship designed or fitted out to deliver ammunition and missiles to the fleet while at sea. Ammunition is considered to be a "stovepipe" commodity in that it is requisitioned and reported on through a single channel. More generally, any general break-bulk cargo ship carrying ammunition may be considered to be an ammunition ship. All explosives are grouped into hazard classification group 1 and are identified as "class 1" materials. Class 1 materials are further divided into hazard class divisions (1.1, 1.2, etc.) based upon the primary hazard inherent to each type of explosive. Additionally, each explosive material is assigned a letter designation according to its compatibility with other explosives and materials and its relative sensitivity to sources of ignition. Hence, you might see a given shipment listed as "1.1C", or "1.5D", etc. The explosives are primarily in divisions 1.1 and 1.5. Division 1.1 denotes a "mass explosion hazard". This means that all, or nearly all, of the explosive compound within a given load or device will detonate instantaneously, producing a blast overpressure of supersonic velocity. Detonation velocity of division 1.1 material is approximately 10k to 30k feet per second. Division 1.5 denotes materials that possess a mass explosion hazard, but are so insensitive that there is little probability of initiating an explosion during normal conditions of transport. The term "net explosive weight (NEW)" refers to the weight of ONLY the explosive material in a given load, device, or article. For example, a military 1000-pound bomb might weigh 1000 pounds, but it contains only 385 pounds of explosive material. The bomb casing and other non-explosive parts of the device, such as guidance components, etc, account for the remainder of the weight. Hence, the total NEW of 5 such "1000 pound" bombs would be 1925 pounds. In the case of a commercial shipment, NEW would refer to the weight of ONLY the explosive material in the shipment, not the gross weight of the shipment. NEW may be expressed in pounds or tons. 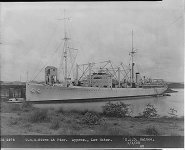 The first Pyro (AE-1), an ammunition ship, was laid down 9 August 1918 at the Navv Yard, Puget Sound, Wash.; launched 16 December 1919; as "Ammunition Ship #1". 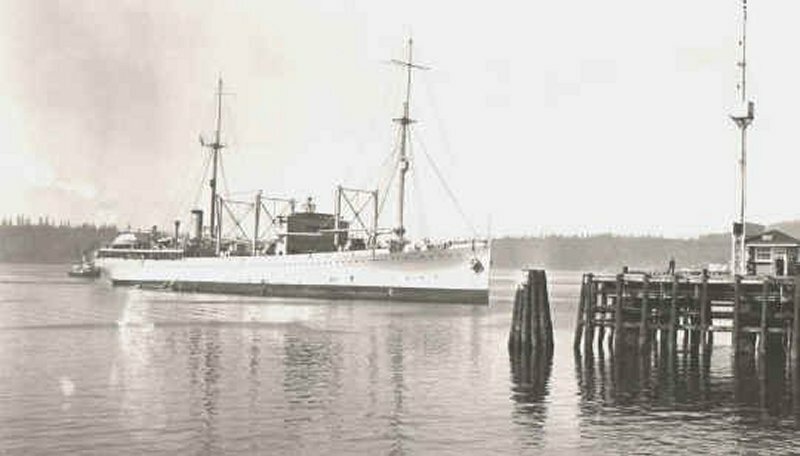 Her principal operations were conducted between ports which extended from Puget Sound on the west coast to as far north as Boston on the east coast. Her most, frequent ports of call included Mare Island, San Francisco, San Pedro, San Diego, Balboa, Guantanamo Bay, Norfolk. Philadelphia, and New York. Besides ammunition and explosives, she also carried general cargo and some passengers. Early in the morning of July 30, 1916, German agents, probably assisted by Irish nationalists, blew up a munitions dump at the Black Tom railroad yard and the adjoining warehouses in New York harbor. By the beginning of the twentieth century, Black Tom was serving as a major munitions depot. German agents who were determined to prevent American munitions shippers from supplying its English enemy during the First World War. Never mind that the U.S. was officially neutral in the conflict at this point. A million people, maybe five millions, were awakened by the explosion that shook the houses along the marshy New Jersey shores, rattled the skyscrapers on the rock foundation of Manhattan, threw people from their beds miles away and sent terror broadcast. The noise of the explosion was heard as far away as Maryland and Connecticut. Pieces of metal damaged the skirt of the Statue of Liberty (it is because of this explosion that the Lady's torch has been closed off to visitors. It was a stunning event, in both magnitude and consequence. Sabotage became a national issue. Congress immediately passed the Espionage Act, which outlawed a variety of crimes associated with German agents. The site is now Liberty State Park, where tourist boats depart to visit the Statue of Liberty. On the morning of Dec. 6, 1917, a tremendous blast ripped through the sleepy town of Halifax, Nova Scotia. The explosion destroyed 3,000 dwellings, killed more than 1,600 people and injured 9,000. Most of the dead were children. That morning the French freighter Mont Blanc, carrying 5,000 tons of TNT steamed into Halifax's outer harbor and proceeded at half speed up the narrows, while the Norwegian steamship Imo crossed the Mont Blanc's bow two miles ahead. As the two ships approached, there was great confusion regarding which ship had the right of way. The Imo reversed engines, but being in ballast, swung so that the bow pointed directly at the Mont Blanc. A collision was now inevitable. The Mont Blanc's captain attempted to minimize the potential of his cargo exploding by maneuvering his ship so that the forward hold, containing no TNT, would be struck. Unfortunately, after the collision, a fire started, and the crewmen tried to put it out rather than scuttle the ship. When the fire reached the TNT, an explosion - equal to a small nuclear blast occurred. The Mont Blanc virtually disappeared, and the shock waves threw the Imo ashore. 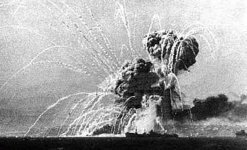 The blast was so intense that other ships in the harbor lost most of their crews and freight cars were blown two miles inland. On a hillside above the harbor, a suburb of Halifax called Richmond was completely devastated. Most of the buildings were virtually knocked to the ground. This accounted for most of the casualties. The Mont Blanc disaster ranks as one of the worst maritime tragedies of all times. This particular ship sailed from New York on its way to Europe, one of hundreds that loaded explosive cargoes in New York for the war in Europe. It was this disaster that stirred American leaders to empower the Coast Guard to ensure that this never happened in the United States. After the Great War, ammunition was stored stateside, near the heavy populated communities in the east. This created a dangerous situation that needed to be rectified. Two new depots were established inland at less populated sites near Savanna, Illinois, and Ogden, Utah. 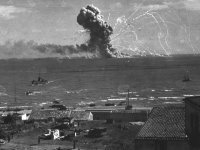 The need to relocate the ammunition stored in the east became apparent after several mishaps. There were several major ammunition explosions during World War II. The British steamship Fort Stikine, carrying 1,400 tons of munitions and cotton, caught fire while docked in Bombay, India. The ship exploded, showering the city with blazing cotton, sinking or badly damaging 21 ships, and killing and wounding nearly 1,400 people. 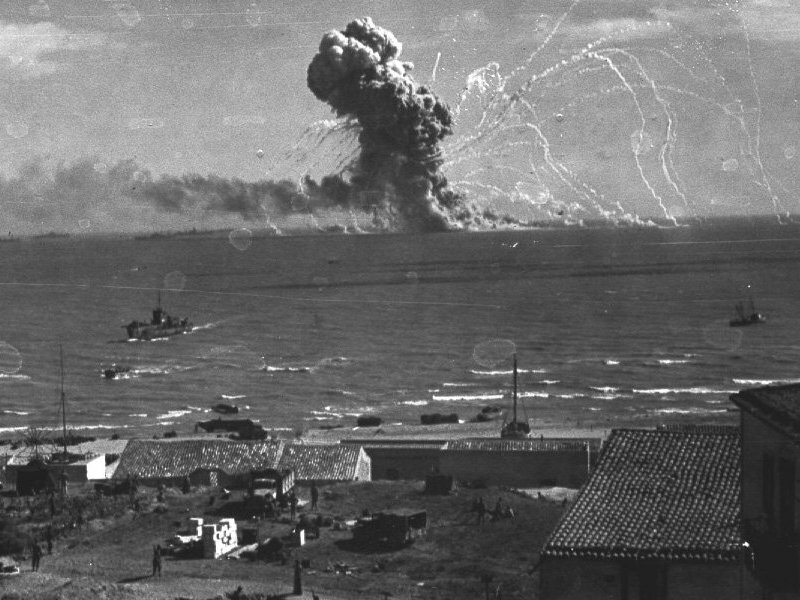 A German air raid on Bari, Italy, in December 1944, also caused an ammunition ship to explode, sinking and damaging almost two dozen other vessels in the harbor. Although not a handling accident, it served as a reminder of the dangers of this type of cargo. On the night of 9-10 July 1943, an Allied armada of 2,590 vessels launched one of the largest combined operations of World War II- the invasion of Sicily. Over the next thirty-eight days, half a million Allied soldiers, sailors, and airmen grappled with their German and Italian counterparts for control of this rocky outwork of Hitler's "Fortress Europe." Two attacks, carried out by Junkers Ju. 88 bombers, sank the ammunition-laden 7176-ton liberty ship Robert Rowan (Ship K-40) at Gela, Sicily before being driven off by antiaircraft fire. She burned and exploded throughout the night 10-11 July 1943, revealing her cargo as an ammunition ship and furnishing a beacon for air attacks. Risking an ammo ship in the attack transport area signified that her mission was to provide re-supply ammunition to the troops which had landed. Such ships did not carry naval warship ammunition. Naval warships were resupplied from ammunition ships which all hoped were more discreetly located. This replenishment was not attempted in actual forward assault areas. Bari, a city on the Achilles tendon of Italy, was a major supply port for the British Eighth Army fighting in Italy. The SS John Harvey, an American ship in harbor, carried a highly classified load of 2,000 100-lb mustard bombs. When the Germans hit Bari harbor in a surprise raid the night of 2 December 1943 they got 17 ships; among them was the John Harvey. Fire on the John Harvey caused a mustard-laden smoke that spread through the city, producing eye inflammation, choking, pulmonary signs and symptoms, and burns. No one really knows the extent of the civilian casualties; however, by the 9th day after the bombing, 59 military deaths had been recorded. 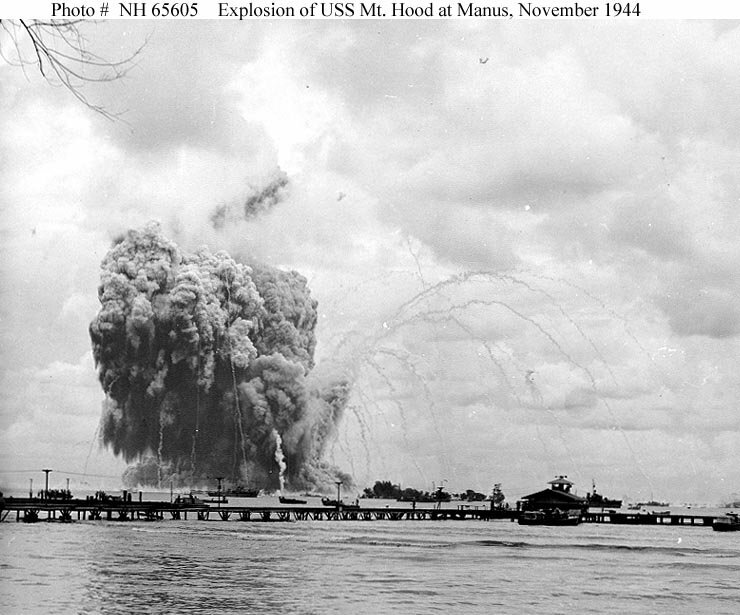 On the morning of 10 November 1944, while she was moored at the Manus Naval Base, Admiralty Islands, AE 11 Mount Hood's cargo of explosives detonated in a massive blast. The AE 11 Mount Hood was a merchant acquired by USN on 28 January 1944 and converted to ammunition ship. The ship was utterly destroyed by the accident, which killed all those on board her. Damage and casualties were also inflicted on ships anchored as far as 2000 yards away. Personnel casualties on Mount Hood and on other vessels totalled 45 known dead, 327 missing and 371 injured. USS Mindanao (ARG-3) was about 350 yards away. USS Mindanao had 180 crewmen killed and injured by this explosion. She was under repair until 21 December 1944. 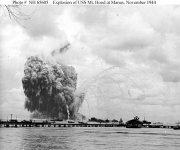 On 21 May 1944 an ammunition ship exploded in West Loch in Pearl Harbor. LST-353, while loading mortar ammunition in preparation for the Saipan operation, burst into flame and exploded with a series of great roars that were heard all over the island and far out to sea. Thousands of rounds of various munitions either exploded or were dispersed over the area. The cataclysmic ammunition explosion killed 163 and injured 396. Six tank landing ships (LST-39, LST-43, LST-69, LST-179, LST-353, LST-480), three tank landing craft (LCT-961, LCT-963, LCT-983), and 17 track landing vehicles (LVTs) are destroyed in explosions and fires. That ordnance was being picked up by 2004. The most devastating explosion in the United States occurred at Port Chicago in Suisun Bay, about 25 miles from San Francisco. On the evening of 17 July 1944, the empty merchant ship SS Quinault Victory was prepared for loading on her maiden voyage. The SS E.A. 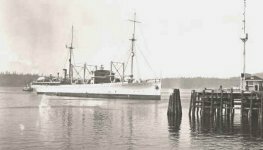 Bryan, another merchant ship, had just returned from her first voyage and was loading across the platform from Quinault Victory. The holds were packed with high explosive and incendiary bombs, depth charges, and ammunition - 4,606 tons of ammunition in all. There were sixteen rail cars on the pier with another 429 tons. Working in the area were 320 cargo handlers, crewmen and sailors. At 10:18 p.m., a hollow ring and the sound of splintering wood erupted from the pier, followed by an explosion that ripped apart the night sky. Witnesses said that a brilliant white flash shot into the air, accompanied by a loud, sharp report. A column of smoke billowed from the pier, and fire glowed orange and yellow. Flashing like fireworks, smaller explosions went off in the cloud as it rose. Within six seconds, a deeper explosion erupted as the contents of the E.A. Bryan detonated in one massive explosion. All 320 men on duty that night were killed instantly. The explosion was so severe that it caused extensive damage for miles. The only thing that prevented a larger loss of life was that the accident site was isolated from the large population centers of San Francisco and Oakland. Of the 320 men killed in the explosion, 202 were the African-American enlisted men who were assigned the dangerous duty of loading the ships. 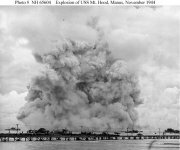 The explosion at Port Chicago accounted for fifteen percent of all African-American casualties of World War II. After the explosion, the Navy would institute a number of changes in munitions handling procedure. Formalized training would be an important element, and certification would be required before a loader was allowed on the docks. The munitions themselves would be redesigned for safety while loading. The Coast Guard kept accidents in ammunition handling to a minimum during the war. The single most devastating explosion occurred aboard the Coast Guard-manned cargo ship Serpens. The Serpens exploded and sank while loading depth charges at Lunga Roads, Guadalcanal, in January 1945. Only two men of the 198 Coast Guardsmen aboard survived. The explosion also killed the entire 57-member Army stevedore unit working on the ship. This is the largest single loss of life in the history of the Coast Guard. Until mid-1966, the discharging of ammunition ships in Vietnam was constrained by the fact that ammunition was removed from pallets at Continental U.S. outloading ports and loaded aboard ship by individual boxes and projectiles. While this maximized the use of ship bottoms, it created difficulties in Vietnam, because offloading by cargo nets and hooks was required and ammunition lot integrity had to be re-established within the depots. Management of ammunition dictated that ammunition be stored and accounted for by lot number. At the request of the Commanding General 1st Logistical Command this practice was halted and all ammunition shipped to Vietnam was palletized. Lot integrity was maintained by ships' holds to the maximum extent practicable. This decision improved the discharge rate of ammunition ships almost 100 percent, allowing discharge offloading time to be decreased from seven days to four days. On 26 December 1969 the Vietnam-bound ammunition ship SS Badger State, carrying 8,900 bombs and rockets equal to 2,000 tons of TNT, was rocked by explosions and abandoned by her crew in rough seas 1,500 miles northeast of Hawaii. The next day 14 crewmen were picked up by a Greek ship, the Khian Star, and a US Air Force HC-130 rescue plane dropped life rafts and dye marker at the site. Rescue planes and ships found no sign of the 26 missing men, some of whom were last seen clinging to life rafts in 20 foot seas. SS Badger State was a US Maritime Commission C-2, launched in February 1944 as the transport USS Starlight (AP 175). US government investigators who inquired into the explosion on the BADGER STATE criticised the procedure used to stow bombs on board. 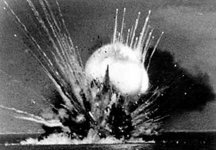 Heavy weather and faulty cargo stowage by the Bangor Munitions Depot caused bombs to start breaking loose. The crew fought for 9 days to steady the cargo and several times changed the course in attempts to find calm seas. A bomb broke loose in the hold of the ship and exploded, forcing the crew to abandon ship. The Navy abandoned plans to salvage the deserted and burning ship on 01 January 1970, and the vessel eventually sank. 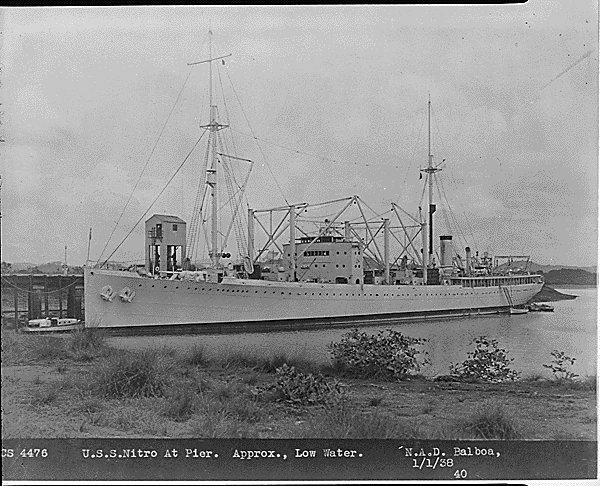 The T-AKE is a dry cargo/ammunition ship that will be operated by the Navy's Military Sealift Command. The ships will transfer cargo - ammunition, food, fuel, spare parts, and expendable supplies and material - to station ships and other naval forces at sea. The T-AKE will replace aging T-AE ammunition ships and T-AFS combat stores ships. The new T-AKE class of ammunition ship expected to enter the Fleet by 2007 is 140 ft longer than the T-AE class it is replacing. The T-AKE class is projected to operate at a yearly savings of $153.3M and a 53% reduction in manning requirements. Both the MV Carter and MV Page were uploaded and back on station at Diego Garcia by mid-2003. Both undergo periodic download, inspection and re-load of ammunition in the near future at Military Ocean Terminal Sunny Point (MOTSU) in Wilmington, NC. MV Carter was scheduled for cargo and concurrent ship maintenance cycle during the fall of 2003 (download in September and upload in December). MV Page was scheduled for early CY 2004 (download in February and upload in April/May 2004). The Army Net Explosive Weight (N.E.W.) aboard these ships is in excess of 13 million pounds. The location and situation at Diego Garcia affords the opportunity to exceed normal port anchorage restrictions. AMC sponsored a viable solution to reducing this excess N.E.W. by cross-leveling amongst three vice two ammo container ships. In order to position these ships at the desired locations with the ARFs, the N.E.W. must be reduced per ship to < 8.0 million pounds N.E.W.. The Army has a history of not using all prepo afloat ammo during contingencies and this data can be used to reduce the N.E.W. above and beyond the introduction of a third ship for cross-leveling. The reduction in N.E.W. below 8.0 million pounds is critical for both anchorage and portside download vice in-stream discharge. The effects of N.E.W. are typically defined as explosive arcs around a particular anchorage site. In addition to avoiding civilian infrastructure within that arc, another major impact is proximity to commercial shipping lanes. Major global commercial seaports that can offload a deep draft ammo container ship are surrounded by ingress and egress shipping lanes which significantly reduces potential portside offloads. The Mediterranean Sea region is a particularly mature seaport/sealane area making the most difficult for prepositioning and portside offloading of ammunition. Even so, the USN has had success in doing so in several key areas including portions of Italy, Malta, and Souda Bay, Crete. Operations successfully conducted have thus far been limited to USAF ammo prepo ships with N.E.W. in the 7.2 million pound total, further emphasizing the need to reduce Army N.E.W. aboard all prepo ammo container ships. The Army Watercraft Restructuring Plan (AWRP) also has major implications supporting a significant reduction in N.E.W.. Since the turn-in of the two leased Heavy Lift Prepo Ships (M/V American Cormorant and the M/V Strong Virginian) as well as the pending loss of the SS Gopher State Auxiliary Crane Ship, all Army watercraft will be prepositioned within two combatant command geographical areas. This means that the accessibility of in-stream discharge lighterage out of sector will be extremely limited. Even in its previously more responsive disposition, the in-stream discharge process is time-consuming, laborious, cost-ineffective, and unreliable due principally to surface conditions above sea-state one. The biggest and most obvious down side to Vert Rep'ing ammo is the damage incurred when dropped on the deck of the receiving ship. Countless pallets, projectile skids and tops, and ordnance containers received enough damage that they will require maintenance before being re-deployed to another MEU. Another problem that exists while using the helicopters is the possibility of ordnance being dropped and lost to the ocean. It is imperative that the slings, nets and cables used in the cross deck are in a good serviceable condition. Ammo at the bottom of the ocean does war fighters no good. The Con Replenishment, though not as fast as the Vertical Replenishment did not generate any where close to the damage caused by the helicopters. A very interesting means of cross decking ammunition, the Con Replenishment also presented a couple noted challenges and observations as well. Notably, where the cable stations were set up, was in a confined space that challenged the most seasoned forklift driver. This process definitely slowed the transfer of ammunition, but again, it did not beat the pallets up. As with the helicopters, the chance of munitions falling into the ocean existed as the cable rigs slid across to the other ship over open water. Visual and physical checks of slings and cables are paramount before starting to sling ammunition across the cable. The best overall way to cross deck munitions is via the LCAC. With its large payload capacity, physical security, and almost zero damage to ammo while ammo movement is being conducted, it is the choice for cross decking ammunition. As with the other two, it also has it's challenges but not as great. The biggest challenge is sea state. If the body of water in which the cross deck is going to take place is not agreeable, i.e. heavy swells, the LCAC's will not be used because the associated dangers involved in steering the LCAC in and out of the stern gates on both ships. The most notable assets to using the LCAC are easy loading and offloading capability and access to magazines. Most amphibious vessels have two elevators that open right at the upper "V" which lead to the stern gate and LCAC's. This allow for a swift transition from magazine to carrier.